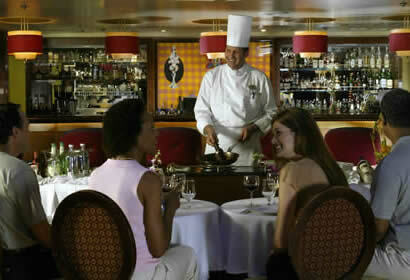 Celebrity Cruise Line is a top-rated premium cruise line with a taste of luxury and is known for its eclectic style. Their ships are decorated with contemporary art and they offer celebrity chefs while still maintaining the traditional dining across the fleet. A very wide range of passengers from families to honeymooners to seniors is attracted to Celebrity Cruises. Acquired by Royal Caribbean International in 1997, they currently operate 9 ships. Celebrity offers a diverse range of activities on board from dance classes to sophisticated wine tastings to art auctions. Their goal is to offer a multidimensional experience designed to reinvigorate the body, enrich the soul and strengthen the bonds that connect people to others and the world around them. Celebrity sails to many destinations all over the world, including Alaska cruises; their destinations include but are not limited to the Caribbean, Alaska, Europe, Mexico, Scandinavia, Bermuda and Panama Canal. Book your next vacation with Celebrity! Azamara is the new, deluxe cruise experience by Celebrity for discerning travelers who long to reach out-of-the-ordinary destinations and indulge in amenities and service unparalleled on the high seas, including Alaska Cruises. The unique offerings of Azamara are beyond compare: butler service is provided in every stateroom; our shore excursions (we prefer to call them shore immersions), are designed to let guests become part of the fabric of life in each destination, instead of merely being an observer; our enrichment programs offer everything from culinary to photographic explorations; our two specialty restaurants provide the finest cuisine at sea; live entertainment can be enjoyed nightly; and the level of service offered is unmatched.